As on of California’s oldest continuously operating computer companies, we offer a full range of sales and service for computers, VOIP phone systems, web presence and SaaS cloud services including email, backup and hosted database applications. 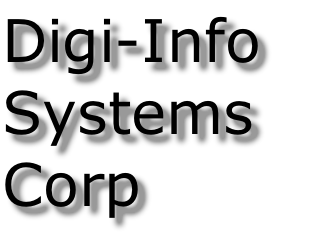 Welcome to Digi-Info Systems Corp's websites. We appreciate your interest in us. When you visit and navigate our sites and when you communicate with us via our sites, we will not collect personal information about you unless you provide us that information voluntarily. Any non-public personal information that you may provide via our sites will be used solely for the purpose stated on the page where it is collected. (In some cases, and in all cases where required by law or regulation, you will be able to update the information that you provide to us either by sending us an e-mail or, where you have established personal profiles with us, by updating your profile online. Please refer to the specific pages where data is collected for more information.) Digi-Info Systems Corp will not sell, license, transmit or disclose this information outside of Digi-Info Systems Corp and its affiliated companies unless (a) expressly authorized by you, (b) necessary to enable Digi-Info Systems Corp contractors or agents to perform certain functions for us, or (c) required or permitted by law. In all cases, we will disclose the information consistent with applicable laws and regulations and we will require the recipient to protect the information and use it only for the purpose it was provided. There are some locations on Digi-Info Systems Corp’s websites where we have made special provisions for a more secure environment in which we can exchange information with you. At each of these locations, we will provide you with appropriate instructions. From time to time, Digi-Info Systems Corp websites may provide links to other websites, not owned or controlled by Digi-Info Systems Corp, that we think might be useful or of interest to you. We cannot, however, be responsible for the privacy practices used by other website owners or the content or accuracy of those other websites. Links to various non-Digi-Info Systems Corp websites do not constitute or imply endorsement by Digi-Info Systems Corp of these websites, any products or services described on these sites, or of any other material contained in them. Digi-Info Systems Corp has adopted and adheres to stringent security standards designed to protect non-public personal information at Digi-Info Systems Corp.com against accidental or unauthorized access or disclosure. Among the safeguards that Digi-Info Systems Corp has developed for this site are administrative, physical and technical barriers that together form a protective firewall around the information stored at this site. We periodically subject our site to simulated intrusion tests and have developed comprehensive disaster recovery plans.